Each Identity Cloud user profile attribute copied to Salesforce must have a corresponding Salesforce Contact field. In some cases, a one-to-one correspondence already exists: for example, the Akamai user profile has a birthday attribute, while the Salesforce Contact object has a Birthdate field. In other cases, no such correspondence exists: for example, Salesforce does not have a field equivalent to Akamai's emailVerified field. If you want to keep track of which users have (or have not) verified their Akamai email addresses, you will need to add a new field to the Contact schema. The following table shows the default mappings between commonly-used Akamai user profile attributes and Salesforce Contact fields. 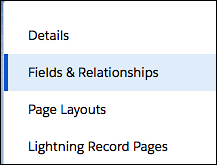 Remember, you do not need to have a Salesforce equivalent for every field in the Akamai profile: you only need to have fields for the attributes you want to copy from Akamai. For example, if you don't need to track email verifications then there's no reason to create an emailVerified field in Salesforce. Note. What happens if an attribute, like emailVerified, is copied over from Akamai, but there is no matching field on the Salesforce side? Nothing: that value simply doesn't get added to Salesforce. A "missing" field does not cause the rest of the data transfer to fail. None. You must create a custom attribute if you want to maintain this data in Salesforce. For Step 3, accept the default values and then click Next. You now have a Salesforce field that maps to Akamai's UUID attribute.